Eritrea will reactivate and stimulate its IGAD membership next week on September 12. PIA may attend in the IGAD’s Heads of State and Governments Summit that’s to will be held on the coming September 12 in Addis Ababa, Ethiopia. So every thing will come to its places…And thus, Eritrea by it self will start a democratic reform soon. Every thing are on the course. Thank to the great leadership of PIA and the the Eritrean government. A MAN WHO NEVER MAKES MISTAKES WOULD NOT GET CHANCE TO LEARN. Dear Gazae How long can one dream without a night fall. Day dream is a very dangerous state of mind. Mr Berhane Abre is sending a message to all of us. If you have listened to his messages written and oral both indicate time is ripe today for change in our Homeland Eritrea. So join in the band wagon of change if not you will remain dreaming with PIA or DIA> This is a wake up call and join the Delyti Fithia and the sooner the better. Politics is poisonous. It’s vicious, and it creates hate, divides people, and makes people a bitter, angry, cynical person. This is the common feelings of the political-avoider, who probably lives in most of us. I don’t have a hidden agenda. I do have enough confidence to cheer others successes. And I possess no finesse and presumption when it comes to dealing with the dastardly. However, I am not saying that I should completely ignore the political climate. Thus the majority of the political conversations I have seen decayed to nothing but name-calling, and I just can’t get behind that. I don’t have room for that kind of negativity to join. So I am no longer as involved with politics as I once was. Nevertheless, I still bang out every now and then and I join a few heated debates here and there, but it’s not quite as enjoyable as I once believed it to be. I might even go as far as to say that I dislike the Justice Seekers and the so called opposition politics, but my problems lie mainly with the some people involved in it. For instance, I spent approximately three to four years avidly in the Assenna. I regret every second of it. There is so much unnecessary negativity. Users would often harass others who disagreed with them. There was no room for civil discussion and people were often insulted based on things that had nothing to do with politics. Often times they don’t defend their opinions reasonably and will resort to throwing insults. “I do have enough confidence to cheer others success” first of all when you try to normalized dictatorship and brutality, you aren’t only in politics, but you are to your eyeball in supporting DIA. Supporting the ruthless dictator, addressing him as PIA and cheering him for his acrobatic power-sustaining maneuver is not a sign of confidence, rather an act of complicit in crime against the Eritrean people and humanity. Have mercy on your soul! Gezae, what are you talking about ? If you are around and following events you can get the picture. And, the picture is in stark contrast with what you want to happen. That’s why you are frustrated. And, live in a constant denial of the events developing. You can call mad dog (esayas) however you want (PIA, King,Marshal,…. ), you can give him membership in any club. But none of these can rescue him from being destroyed by the wave of the suffering Eritrean’s struggle. That is what is scaring you. and We know. And We don’t care. I’m sure you are a paid pfdj stooge ( nay ezni -03). you said Eritrea will start reform after PIA attends in one of his new clubs, hahahahahahaha you also added ‘who doesn’t make a mistake, he will amed some’. it is laughable. nonetheless it signals you realized what is brewing by the people is not something old mad dog can withstand and his defeat & fall is enevitable. we are on each other’s mission. The Eritrean people vs mad dog. so don’t waste your time you won’t fool or deceive anyone by spreading zena bado seleste. Even if god come and tell us mad dog will change, we rather reject the presence of god We are done with mad dog. time is up ! so, don’t come on Assenna and write some stupid things like you always do under different names to make it look like ohh many people are having the same good view of the developing event. Be assured, we know what is going on. I understand from the very first time you are emotional. Emotion is how animals traditionally solve problems. But intelligence and political wisdom move faster with focus, not emotion that lacks maturity and control. Hence, Frustration, discouragement, hate and distress are a waste of energy. They’re unhealthy and unpleasant in contemporary political situation within inside Eritrea and in our region. They’re the inevitable phases we go through when our mistakes are bigger than we are. Strong negative emotion openly corrupts rational thinking, all potential serenity & good will. It is possible the reflective behaviour, at least in part, determines how much a person learns from an experience. Hating PIA pretends to reward the psychologically lazy disproportionately. Just like anything of any value, it requires something from you. In my observation, some people will for some reason, choose not to reflect deeply enough on the situation or event while others will take the pain to go deep enough to reach to another level of wrong meaning. Gezae Himum, what school did you go to, was it the school of Humumat animals??? 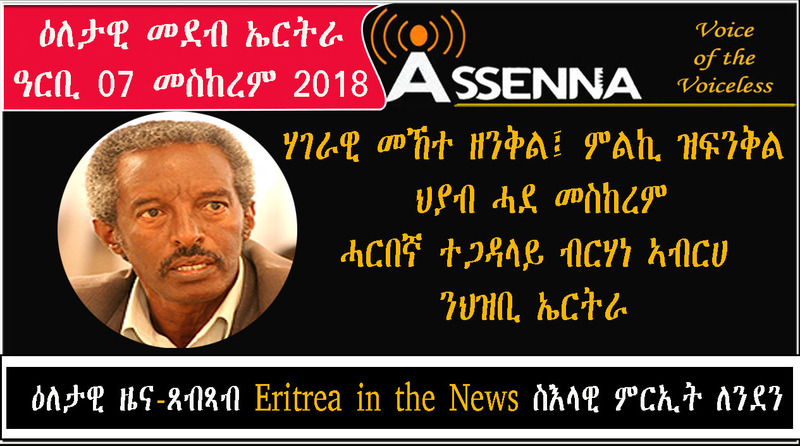 senkam,indeed you are just like your name in a positive connotation.The line has been drawn,like you said,’The Eritrean people vs mad dog’,and it is scaring the crap out of his worshipers.